Jamar Nicholas is a Philadelphia-based artist and educator. He has dedicated his career to educating young people, helping them realize the power of visual narrative. 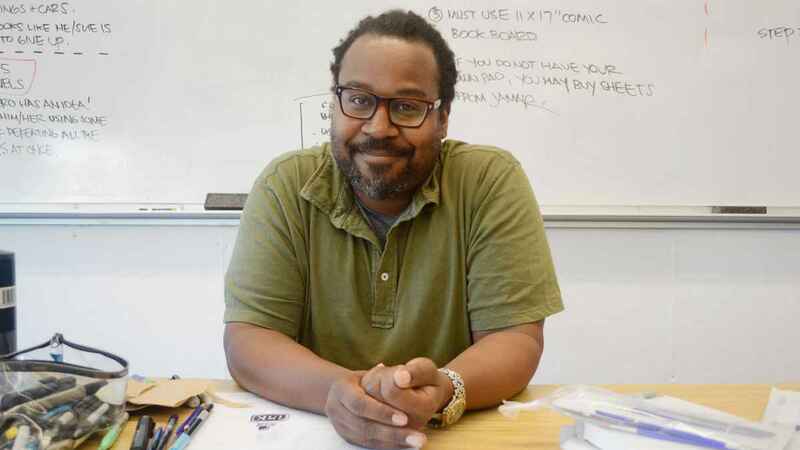 He has taught and lectured on the topic of comics creation at numerous institutions, dedicating his career to empowering young people to create their own cartoons and comics. Jamar aims to bring awareness to anti-bullying, healing, positive images of people of color, the idea that everyone can be a hero, channeled through images and art of the every-person archetype. Jamar will present an interactive digital slideshow on his career as a cartoonist, or focus on specific projects or themes. Through a “chalk talk” (Talking while drawing) presentation, Jamar will discuss important issues from bullying awareness, healing (learning from past mistakes, and experiences; ex: Baltimore riots), being a hero (in your community, for your family and friends, and to yourself), positive images of people of color and the every-person archetype (representing the common man and woman). Must provide surface for drawing, such as a stable whiteboard, or easel with pad / removable sheets of paper. Ever find yourself stuck for cartoon ideas? Put on your wetsuit and dive into the IMAGINATION AQUARIUM, where cartoonist Jamar Nicholas will help you catch ideas in your net and create awesome cartoons! Beginning with art ‘warm-up’ drawing exercises, Jamar instructs kids on overcoming creative ‘artist block’ by creating fun and funny idea mashups! Interactive instruction and drawing fun for the whole family. Must provide drawing materials for session: pencils and paper. These long-form programs will instruct a group on the basics of comic-making, ending with the students creating their own worlds, characters and short-form stories. Week-long residencies can result in the class publishing their work via photo-copied ‘mini-comics’. Single Presentation Visit: One 45-60 min session. Additional travel rates/fees may apply to longer programs. Half-Day Visit: Two 45-60 min sessions or 3-hour workshop. Full Day Visit: Up to Four 45-60 min sessions between groups or 6-hour workshop. Full Day Visit With Overnight: In the event that your location’s driving time is in excess of two hours, or if the scheduled start time is an early morning event, overnight lodging may be necessary. Multi-Day to one-week Residency: Must include lodging or travel reimbursement. Please inquire at least three months in advance of program dates. Interested in having me visit your location? Feel free to email me at Jamar@jamarnicholas.com, my assistant, Sandra, at Sandra@jamarnicholas.com, or my publicist, Kristen, at Kristen@jamarnicholas.com. Want the Jamar's full presenter's kit? You can download it here! “What an honor and delight to have Mr. Nicholas talk to our aspiring young artists and designers about his illustrated work on Geoffrey Canada’s book Fist Stick Knife Gun. Our students remained thoroughly engaged throughout the entire program. ​"High school students are often hard to engage but Mr. Nicholas did it with ease. His adaptation of Mr. Canada's work is accessible to even the most reluctant of readers. His presentation was equal parts educational and entertaining, serious and funny. His encouragement to the students to make a life where they can do what they love AND be successful and financially secure was inspiring. I was happy to have him and hope that he returns to inspire more students in the future."